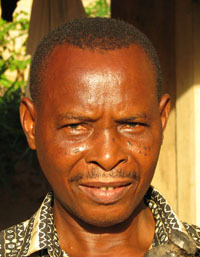 Patrick was born in 1954 in Maurunga 40 km from Mtwara in southern Tanzania. His grandfather Joseph Mtulumaa tought him to carve. He came to Dar es Salaam in 1978 and now he lives here with wife and 5 children. He carves shetani but he also made the door at the Old Post Office in Dar es Salaam. One of his children carves in the Mwenge market.